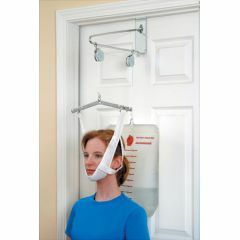 i use this to relive tight neck muscle.i also use a microwaveable neck band with this product with great success. by Cripplekid from Orange City, Fl. Water Bag Unwieldy. Difficult to manage alone. The traction unit is okay but I paid $25 (twice the cost of the unit) for expedited service and it took a full week to get to me. Unacceptable. Especially when you're in pain and paid for quick service. Works, but very difficult to use alone. General neck and back hea. I lay on an inclined bench press bench and hang the weight over the bar. I am strong and love the feeling of traction so I use dumb bells at 60 to 70 lbs. Easy to use but a little uncomfortable. Seems to do the job as needed though.